A professional baseball player for the MLB who plays for the Houston Astros made headlines this week after he gave a waitress who had her car burglarized earlier that day a $500 tip. When you are working as a waitress tips represent a huge portion of your income and so getting such a large single tip is a huge blessing. The MLB player is Alex Bregman who is a third baseman for the Texas-based Astros. Bregman recently started his own YouTube channel dedicated to giving back to those in his community. One of the first clips that Bergman updated to the channel included he and his friends planning to help a waitress in need. They call the restaurant, The Moonshiners, and ask if any of the servers have recently had any hard times. The 24-year-old MLB star was told by the manager that a waitress named Jordan Thompson had her car burglarized that very day and a large amount of money was stolen. In the video, Bregman explains his plan to his friends. "We all came up with this idea to do a YouTube channel and we wanted to do some funny stuff, we wanted to do some stuff like a behind-the-scenes look at our lives during the off-season, but we also wanted to do some things that help people out, especially here in the Houston community – a community that’s done so much for me. We thought this would be a good idea, help a waitress who is struggling right now." When speaking to why he feels so strongly about giving back to his community, Bregman says, "I think it’s a good deed, and I think when you’re an athlete or someone who has the platform that we have, I feel like it’s important to give back and use that platform in the right way." The professional baseball player said he was "kind of nervous" prior to going to the restaurant but his friends helped him make small talk with the waitress in need. When the athletes asked for the check, they left a $500 cash tip behind for the surprised Thompson who gladly received the tip with tears in her eyes. Thompson is a college senior and she races out of the restaurant and gives Bregman a hug and thanks to the group for their generosity. Bregman told Thompson, "We wanted to help out. Hopefully, that helps a little bit." Thompson said the tip "more than helps" and added, "I'm so happy right now. Thank Y'all so much." Thompson said in a later interview with Today Food, "It meant a lot to me personally because of the timing and money getting stolen from me. I was super grateful and also relieved because now I can actually focus on school and have less stress on me having to work extra. As soon as I saw the money, I just hugged them. I was super thankful." 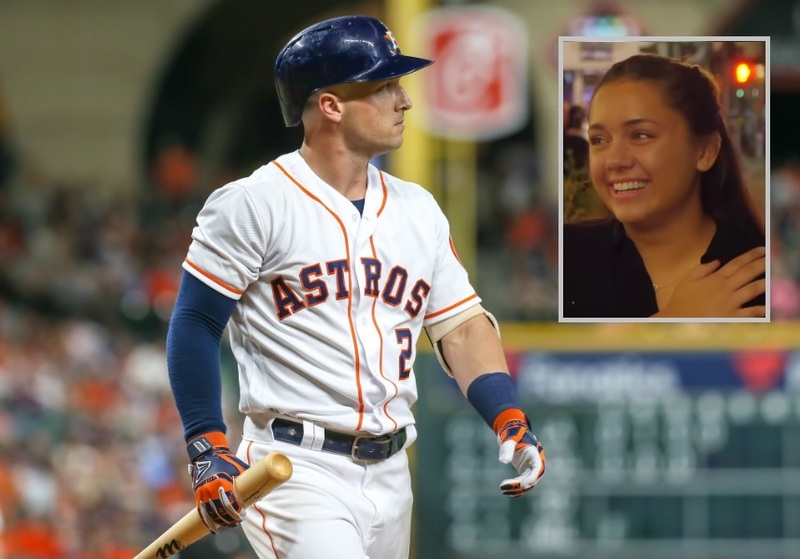 The stunned waitress even posted a tweet thanking Bregman later on saying, "I had a breakdown yesterday bc my money I was going to deposit for my bills was stolen. I only work 2 days a week since I’m a full-time student-athlete & had no idea how I was going to make it up … then this happened. I am so thankful." You never know what kind of person you are dealing with, they have just lost their only son to cancer or they may have just been divorced, that is why is always best to treat people with kindness. If you can afford to leave a big tip at a restaurant that is going to make a big difference in someone's life. YouTube comments praised Bergman saying, "You’re such an amazing person. Houston is lucky to have you. You’re the real MVP." Another user wrote, "You’re the man Bregman!! The food industry is harder than most people think and to tip your waiter a good amount of money means a lot." Bregman has more plans in the future to help give back to his community. "We're starting to do more things," Bregman said. "We're going to be out in the community this offseason a bunch, helping out in a bunch of random ways, so it'll be good and hopefully affects and helps a lot of people." Dumbass white knight cuck. Does anyone watch baseball anymore. Never grow weary in doing good. When you do it in private it brings much reward in Heaven. God bless you all and hope many more who have the ability to help other will join in especially during the Christmas season.